Bio: Lisa Fine, creator of Lisa’s Foods on the Move, is moving towards living a more sustainable and fulfilling life through getting back to basics. Join her as she moves towards a simpler lifestyle through food, fitness, travel, gardening, and more. You can learn more at her blog, Lisa’s Foods on the Move, where she writes about how to move towards simplicity through unconventional eating. Lisa loves getting in touch with her readers - reach her by email at lisasfoods@gmail.com or write to her @lisasfoods on Twitter. Q: When/How did you come up with the idea of creating an ebook? A: As an avid reader, I've always wanted to write my own book, but knowing the costs and time of finding a publisher, I wanted to do it on my own. A few weeks later I was on the phone with a good friend and fellow blogger, and together we brainstormed some ideas to make my dream become a reality. A book based on simple living, which is something I seek in my own life, seemed like just the right fit. Q: What sorts of topics do you cover in Seasonal Simplicity? What can we expect? A: You will find all kinds of topics in Seasonal Simplicity, to help you bring simplicity to any area of your life. There are vegetarian and vegan recipes, budgeting tips, meditation exercises, a beginner's knitting pattern, fitness ideas, crafts, and ways to pare down excess stuff. You'll also find nine planning and reflection worksheets to help you brainstorm ways to make your year simpler. The book is user-friendly, set up as a journal or workbook, to help you meet your simple living goals as you make your way through the year. Q: How did you come up with the name "Seasonal Simplicity"? A: I wanted my book to span the whole year, allowing people to make small, attainable changes as they see fit. I also believe in seasonal eating and living, and wanted my book to reflect the changes of the seasons. For example, you'll find oatmeal and roasted vegetable recipes within the winter section, and a homemade jam recipe in the summer section. 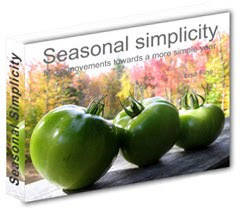 Seasonal Simplicity is divided four main sections, one for each season, and the activities and recipes in each section match the time of year. Q: Are there any parts of the process of making the book, or parts of the book itself, that you are most proud of? A: I love collaboration in projects - seeing people come together for a cause they care about or believe in. Working with the four other bloggers was a wonderful experience, from brainstorming and collecting ideas, to emailing and promoting the book. It made me realize how much I'm energized by working with others, and how much I love the blogging community. Q: Who are some of the people that have inspired you to grow your passion of food, cooking, health and sustainability? A: Over the years I've been inspired by many food writers, environmentalists, and simple living advocates. I especially love to read books by Scott and Helen Nearing, pioneers of the homesteading and vegetarian movements. I also enjoy Michael Pollan's work, and was recently impressed by Jim Merkel's book Radical Simplicity. Q: Do you have plans to write more books in the future? A: I can't wait to get started on my next books. I have two ideas that are in the making. The first will be a free ebook on the pleasures and benefits of walking, which should be available on my blog later this month. The other book I'm planning is a vegetarian collaborative cookbook, and I am currently setting up the details with a non-profit organization; the net profits from book sales will be donated to the organization. More details on that to come soon - if you're interested in submitting a recipe, send me an email at lisasfoods@gmail.com for more information. Q: Lastly, what do you hope your readers will gain/take from reading Seasonal Simplicity? A: My main goal with writing Seasonal Simplicity was for readers to find easily attainable ways to slow down and enjoy life more. I've found much meaning in simple pleasures - making dinner with friends, reading a good book while sipping a hot cup of tea, meandering through the woods on a sunny day. I'm all about living life to the fullest, and feeling healthy and connected to my friends and community. I hope you'll enjoy finding simplicity too in this new year. Simplicity and how you can own a copy today! Thank you Lisa for sharing your time with us to talk about your new eBook. I wish you all the best in success with the book, as well as your journey ahead. Smile. Isn't Lisa wonderful? I so enjoyed contributing to her book, and I also enjoyed reading a bit more about her here! Thank you for sharing such a great woman with me. I hope your weekend overflows with good food, good friends, and love! What a great interview. I will definitely check out the book! I love the idea of doing things seasonally! Thanks Kelsey! Great Q&A... I definitely want to check the book out now, too! Thanks Kelsey! Hope you're having a great day! Thanks for sharing this interview with us. Sounds like a really great book!!! Thanks for sharing this, girl!!! Yay! Thanks for the interview, Kelsey. I really enjoyed working with you. So fun. Have a great weekend. Love the Q & A and you should start your own magazine, Kelsey! "Snacking Squirrel" magazine. You always have interesting topics! Thanks for the lead to Lisa's ebook. Hi Kelsey! Hi Lisa! Two of my favorite bloggers all rolled into one! Loved Radical Simplicity, by the way. @Wendy - Aw, thanks, hi Wendy! Yes, isn't it a wonderful book? For those of you who haven't read it, check it out. Really great ways to live more simply and environmentally friendly. What a great interview, Kelsey! This book sounds awesome. I love the title and the concept.